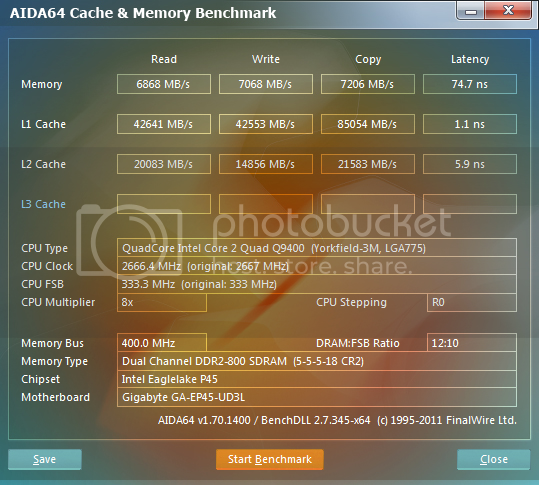 There's nothing wrong with the E7600, especially when you can OC to 3.4GHz on stock vcore. It would be a waste of money to invest in new CPU just to find out you must update BIOS after all. Updating BIOS may be all you need, you can pull one stick of ram for the update too if you are too worried. Flashing with the built in Q-Flash is quite safe. I have flashed my P43 board several times, and this board twice. I definitely agree, you should update to the latest BIOS no matter what CPU you have or plan to get. i think core0 is too much hot on load, or this is normal for core0 ? 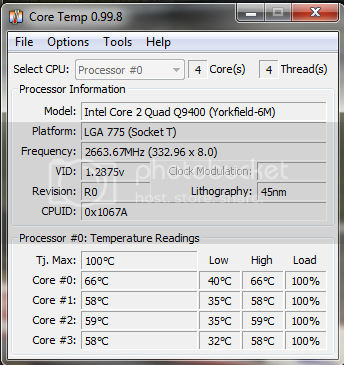 can i overclock with core0 getting 66º on load ? 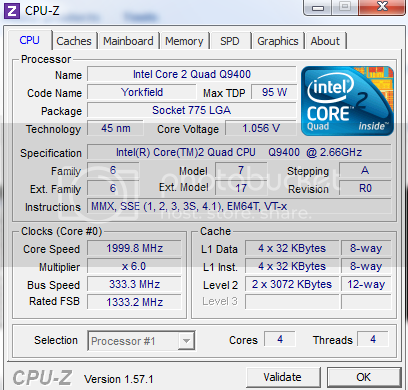 Are you using the Q9400's heatsink or the E7600's? The built in DTS are not very accurate and error may vary from -10c to +5c. What kind of load was it for those temps? 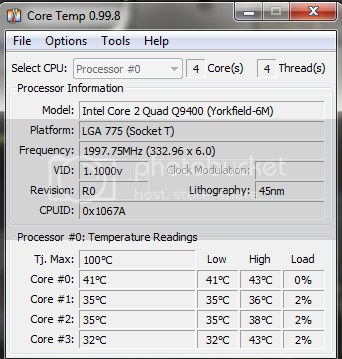 Yes those temps are a bit too high for stock with Prime95. why only core 0 is too much hot on load ? Temps also depend on the ambiant temperature. As I said the sensor are not very accurate, it may be just that that cause the difference. At 23c ambiant I get 31c idle and 47c Prome95 (small FFT 24K) with stock settings. You need a better cooler if you want to OC. what is better ? stock or o.c ? @900mhz is harmful for memory ? any benefit ? No 900 is not harmful to the memory, hi voltage, or hi temperatures may be harmful. OC Read and latency results are worse than stocl, you need to set tRD(Static tRead Value) manually, try 8-7. 400x8.5 is not a problem for the E7600, 400x9 should be easy too, but when OCing you must be persistant and patient. If 375MHz FSB is easier for you to tweak you can OC with mulriplier to 3.75GHz or 3.93GHz, but you will need an aftermarket cooler for it.